Every so often, I’ll get together with a friend or two who also like to cook, and spend the day making something elaborate and extravagant. 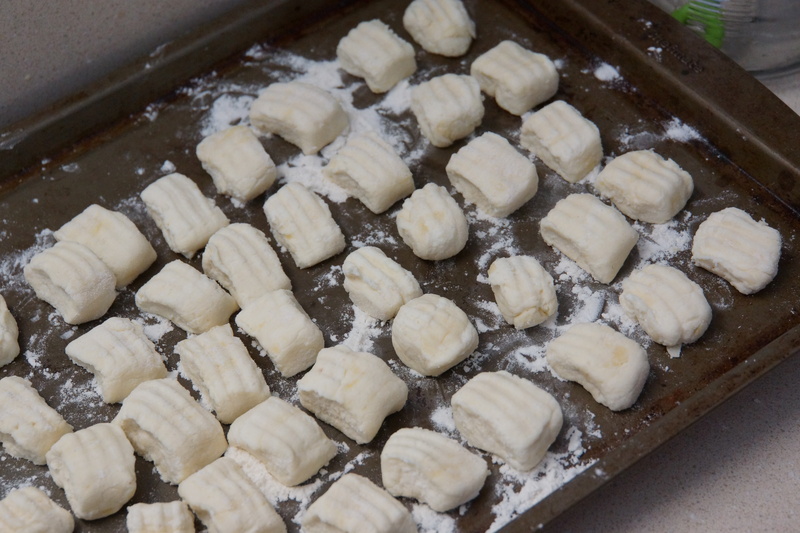 A couple weekends ago, my friend Phuong and her boyfriend came over, and we made gnocchi. And, in the process, I had another breakthrough. Since this was our first time making gnocchi, we decided to go all out and make two batches: potato and ricotta. It was a long, starchy, floury, methodical process, and we were all dusted with white up to our elbows by the time we were done. After several hours of mixing and rolling and cutting and shaping and simmering–not to mention the sore feet from standing, and stiff arms from crowding four people into one tiny kitchen–we sat down to lunch: piles of dumplings blanketed with rich homemade tomato sauce. We passed a hunk of Parmesan and a grater around the table, and sipped wine from mismatched glasses. It was a solid, homey, nap-inducing meal. My first discovery was not much of a surprise. As it turns out, I’m just not crazy about potato gnocchi. Even when I make them myself–when they’re delicately handled, coddled like newborns, so light they almost fall apart–I don’t like the way the starch stumbles over my tongue and settles like a brick in my stomach. The ricotta gnocchi were something else: springy instead of starchy, soft but chewy, with just a whisper of milkiness from the cheese. Blanketed with tomato sauce and showered with cheese, they felt right at home–satisfying in that bone-deep, comfort-food way. We gobbled our portions like maniacs. But yet, as I was eating, I felt odd. It took me until later that day to put my finger on why. When I first realized as a teenager that food was going to be my albatross, one of the things I mourned most was big bowls of pasta. I’d never even tasted gnocchi at that point, and now they would always be tainted. 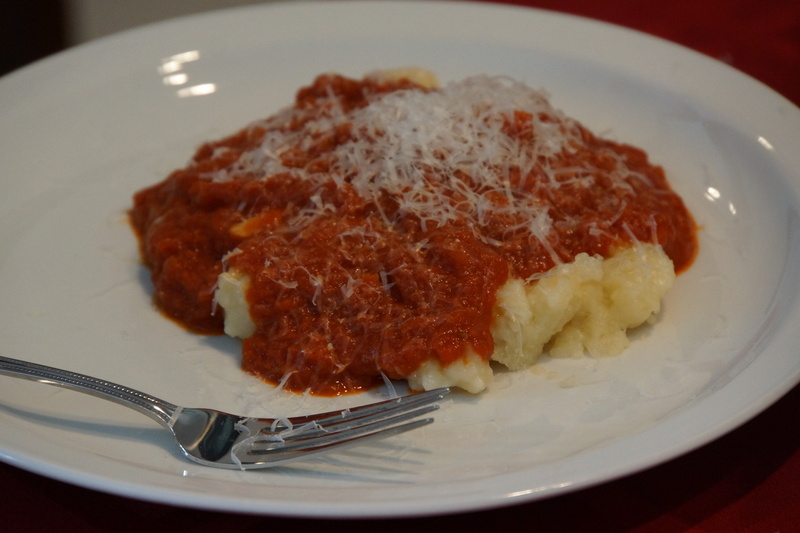 But, as I was eating those ricotta gnocchi, I felt none of the turmoil I was used to. I knew they were fresh, and made with my own hands, and not especially healthy. And I knew I could finish my portion, and enjoy it, and deal with the gut-rumbles and heavy eyelids that would come later in the afternoon, and then chalk it up as a lesson learned. I wasn’t thinking about gnocchi as a forbidden food, but as a fun and lively indulgence that I’d probably never make again. That was worth all the hours and the delicate handling. A terrific-tasting batch of gnocchi, and another small weight lifted. Everybody needs a good tomato sauce recipe in their back pocket. This is a new one of mine. All told, this tomato sauce took nearly three and a half hours to make. And it was worth every minute. You don’t get that depth of flavor with a brief bubble and a stir; it only comes from a low flame and a lazy afternoon, sitting and sputtering away on the stove while you go occupy yourself elsewhere. I made this on a day I worked from home, sitting on the couch and pounding out assignments while my apartment filled with the heavy late-summer fragrance of concentrated tomato. It was glorious. I highly recommend it. Then came the tasting. The sauce came out of the pot aggressively acidic, so much so that I debated adding a sprinkle of sugar to help the caramel-sweet onions along. But then I packed it up and stashed it in the fridge overnight, and by morning the flavor had smoothed quite a lot. I have almost a quart of it squirreled away in the freezer right now, mingling and mellowing and waiting for the next time I need tomato sauce in something. This is a sauce that was made to last; you couldn’t go wrong making a double batch and freezing half for the future. One of the things I love most about creative pursuits is how a kernel of an idea, picked up from elsewhere, can take root in my body and morph, almost of its own volition, into something new. It happens to me in my writing, and even more so in my cooking. Sometimes the idea twists and warps in the process, emerging partly-formed and disappointing; but other times it’s charmed right from the get-go, and that’s what really keeps me going. This was one of the charmed ones. It began as I was casting about for a Spanish-inflected vegetarian main course to serve for my mother’s birthday, a headliner for the opening act of those glorious clams and artichokes. From somewhere in the dusty crannies of my brain came a vague memory of a Minimalist recipe for chickpeas with spinach and sherry. I went looking for it, and in the process found another Minimalist recipe for rack of lamb with pimenton-flavored rye breadcrumbs. 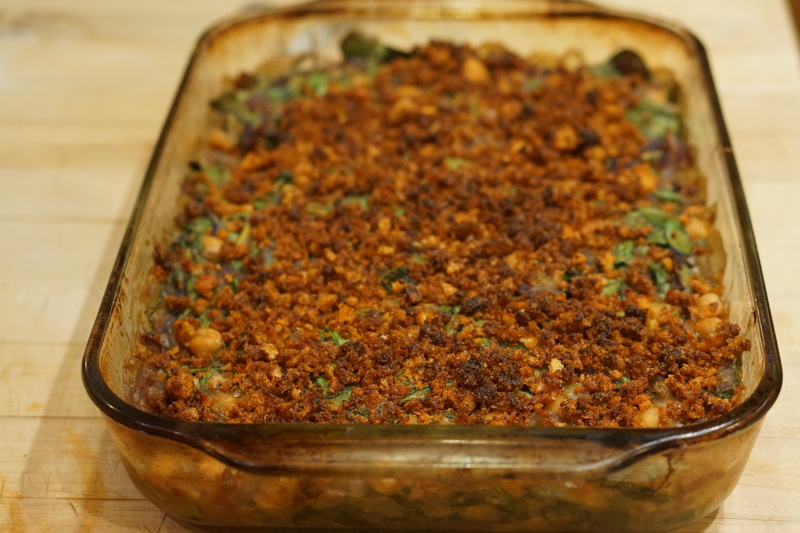 I seized on a sentence in the accompanying write-up: “[these breadcrumbs] could turn the simplest vegetable gratin into something truly special.” And suddenly the two recipes began to meld and harmonize into one: a chickpea and spinach gratin, flavored with sherry and topped with those incredible breadcrumbs. From there it was just a matter of finding a good chickpea gratin recipe to riff on, and then putting everything together as best I knew how. From the minute I sent the gratin into the oven, I knew I had a winner. Just the carnival-clutter appearance of it made me smile, with purple-red onions and sandy-colored chickpeas and grassy spinach and that gorgeous brick-red breadcrumb blanket. From the oven I could smell smokiness and garlic and the sweet mustiness of Amontillado sherry. It came out bubbling, deep crackling brown on top, and almost luscious underneath. 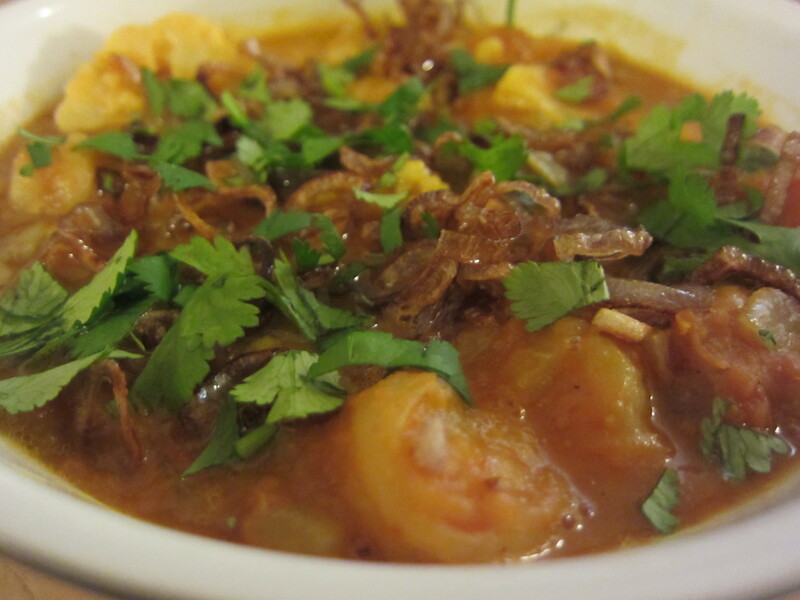 The onions–a whole mountain of them–melted into filmy ribbons in the oven, and the spinach turned dark and silky. The breadcrumbs themselves were richly smoky, crisp, almost meaty, like a strange vegan hybrid of bacon bits and chorizo. We devoured our portions and swabbed our plates with bread to mop up every last bit of the sherry-infused gravy. My one possibly-unnecessary step was to mash half the chickpeas before adding them to the gratin, hoping that the mix of pureed, chunky, and whole chickpeas would lend contrast and interest to the gratin. But the mashed chickpeas just dissolved into the sauce, while the whole ones stayed whole, becoming lush and soft in the oven. If I had it to do over again, I’d probably keep all the chickpeas whole, for more creamy texture interruptions throughout the gratin. Call the mash an optional step. Do it if you want a slightly thicker filling, or don’t if you want a greater texture contrast. This could serve nicely as a vegetarian or vegan entree, or as a side dish for chicken or light-fleshed fish. And the leftovers are just made to be reheated for breakfast with a fried egg on top. It’s a good one, this gratin; I’m proud of it. It’s the kind of success that keeps me cooking. My friend Anthony’s parents have a very prolific lemon tree. The last time he went to visit them, he came home with ten pounds of lemons, and promptly foisted about nine pounds off on me. I was grateful, to be sure, but it was a bit of a scramble to figure out how to use them all up before they went bad. I made a big batch of lemon curd, and a pair of lemon pies (which I neglected to photograph, whoops). That still left me with a hefty armful of lemons, slowly slumping and wrinkling and growing uglier by the day. Enter the ice cream machine. I could have just made a simple lemon sorbet. But I wanted something jazzier, so I added a shot of elderflower liqueur. 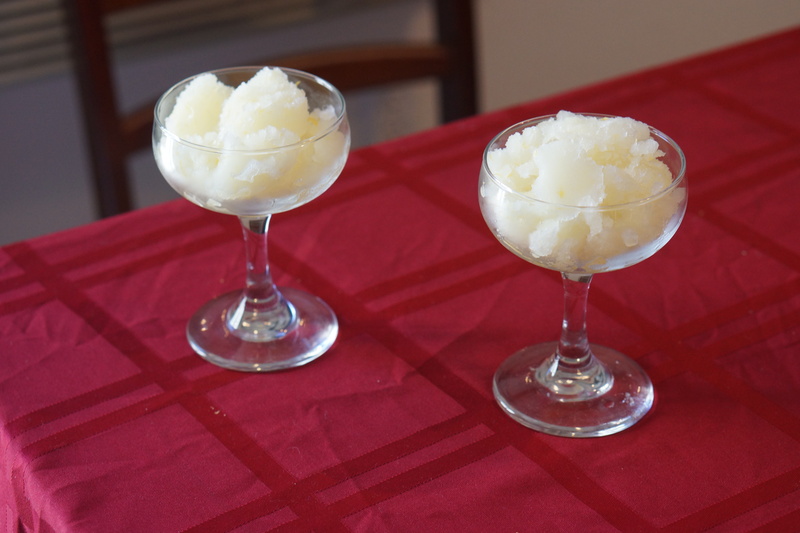 Partly, it was a practical choice: a splash of alcohol in a fruit sorbet is a quick-and-tipsy way to keep it from freezing too hard. But I was also curious how the flavors of lemon and elderflower would mingle together in a chilly base. As it turns out, they get along just fine. The sorbet turned out really lovely, shimmering yellow with tiny saffron-flecks of zest throughout. The liqueur hummed quietly, subtly, in the background, amplifying the intense floral fruitiness of the lemon itself. It was the kind of thing I could easily imagine as a palate cleanser at a snooty dinner party, or as a bracing after-dinner treat on a sticky summer evening. Even with the booze, this sorbet is best eaten within a few hours. The longer it sits in the freezer, the icier and harder it’ll get. I ended up leaving my sorbet for two weeks before eating it, which meant I ended up with a crackly crystallized lump instead of a lush scoopable mass. I had to chip it into glasses like a granita. The flavor was still terrific, but it didn’t have the soft spoon-sliding texture I had hoped for. If you’re going to keep the sorbet longer than a day, make sure to take it out of the freezer well before serving it, to give it time to soften and relax. Oh, and if you don’t think a bowl and a spoon is enough fanfare, try slipping a spoonful of sorbet into a flute of sparkling wine. I know. 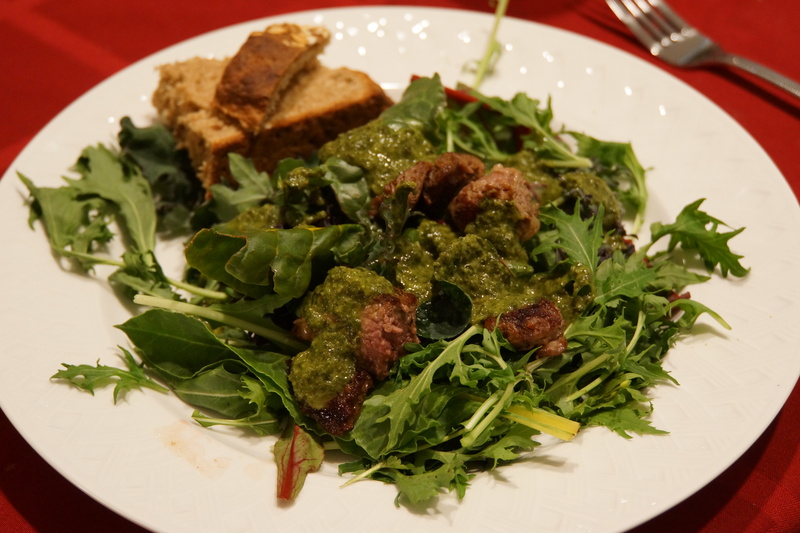 Here’s something a little different for St. Paddy’s Day: a winter-to-spring lamb salad with a bright green vinaigrette. The lamb itself was simple. Salt, pepper, hot pan, sear. I tried to do a mustard-crust thing on the chops, but it didn’t turn out well, so I’m going to declare it unnecessary. I’m also not the most competent meat cook, so I ended up pulling the lamb from the pan while it was too raw and having to re-cook it later. That’s a mistake I don’t recommend making. What I do recommend, though, is letting the meat sit in a loose foil packet for a few minutes when it comes out of the pan, to let the juices re-settle throughout the meat. It makes for a much more succulent final product. For the dressing, I used a recipe I picked up in an online comment forum: a blended basil vinaigrette, thick and tangy and appealingly pesto-like. I’ve made this dressing before, as a pasta sauce, but it was especially welcome against the gamy-sweet lamb and crunchy greens. I used a mix of basil and mint here, but it could easily be done with just basil or just mint. It’s a little more involved than your average vinaigrette: first you blanch the herbs to lock in their bright green color, then blend them with garlic and shallot and vinegar, before streaming in just enough oil to make a thick paste. You could add an egg yolk too, for a richer and more unctuous dressing, almost like a thin Hollandaise. With egg or without, though, this vinaigrette stands on its own: it’s the perfect texture for pasta, and would also make a stellar sauce for simply cooked chicken or fish. Make it for this salad, and then make it again. It will reward you. Oh, and of course, we ate our salad with Irish soda bread. I am nothing if not consistent. Every once in a while, I’ll order something at a restaurant that’s so wildly delicious, yet apparently so simple, that I’m immediately determined to recreate it at home. This dish is one of those. Like many of my favorite food travel memories, this one happened in Barcelona. Towards the end of our stay, Sam and I decided to visit the Mercat del Born, only to discover when we got there that it was closed for renovations. Suddenly loose in an unfamiliar neighborhood, with lunchtime looming, we ducked into an upscale-looking place with the auspicious name Cafe Kafka. It was dim and calculatedly deco inside, with a floor-to-ceiling bar and a dining room outfitted in black and grey. Three words jumped off the appetizers list at me: almejas con alcachofas. 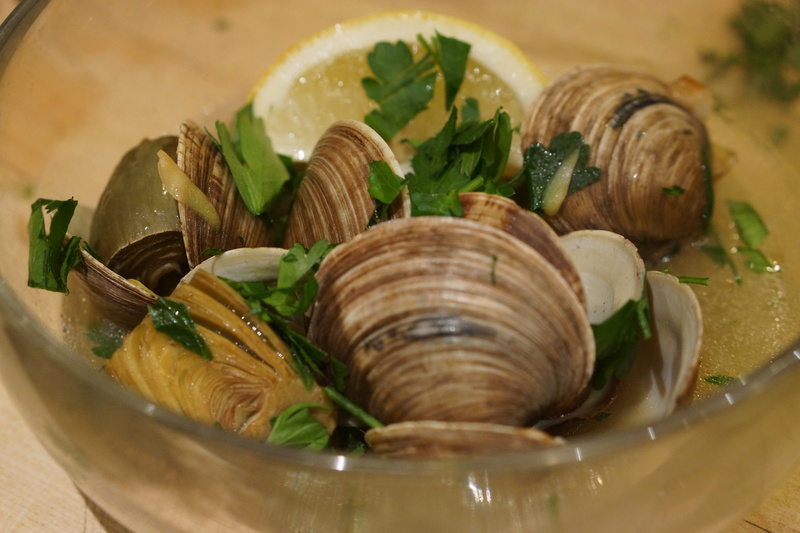 Clams with artichokes. Two of my favorite foods. I couldn’t resist. It arrived in a teeny-tiny cast iron pot: a cluster of yawning clam shells, perched on a pile of baby artichokes. The clams were chewy and lovely, as usual, but the artichokes were the real revelation–tooth-tender and almost buttery, drenched in the seawater-sweet liquor from the clams. The combination of lightly vegetal artichoke tang and garlicky salty broth made for even better bread-dunking than usual. I knew immediately I had to recreate it at home. Unfortunately, I’m dating a bivalve-hater, so my clam experiment had to wait. But a couple weeks ago, when Sam was busy and I was tapped to make an early birthday dinner for my mom, I saw my chance. It turns out that making clams with artichokes is a little more complex than just steaming clams on top of artichokes, but not by much. It’s quick, deceptively simple, and special enough for an Occasion. Good crusty bread is absolutely not negotiable here–every drop of that sweet-salty-tangy potion at the bottom of the bowl should be savored. This may require picking up the bowl and sipping the dregs.